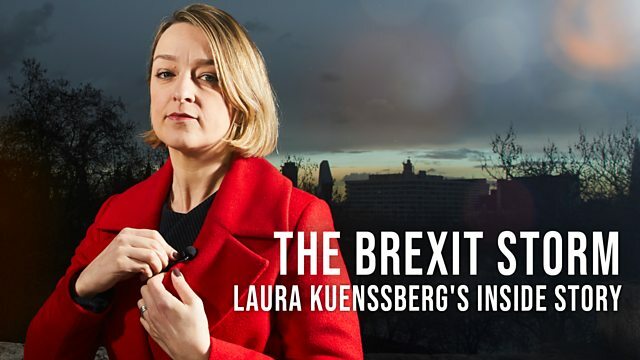 Over nine tumultuous months, BBC political editor Laura Kuenssberg takes us inside the most extraordinary political story of our time – Brexit. Over nine tumultuous months, the BBC’s political editor Laura Kuenssberg takes us inside every twist and turn of the most extraordinary political story of our time – Brexit. Cameras go behind the scenes to follow the political players and Laura as she reports on exceptional events. The film covers Theresa May's efforts to secure backing for her Chequers plan, cabinet resignations and backbench plots. We also see leadership challenges and historic parliamentary defeats, as well as a national campaign for a second referendum which causes splits within parties. With Westminster in crisis and Theresa May grappling to get her deal through, this film reveals the country's most influential parliamentarians as they battle to secure the future they want for Britain – in or out of the EU. This one-hour special takes the viewer into the centre of the Brexit storm in a highly charged and emotional battle for political victory. Visit OpenLearn, to find out more about how politics affects you.